Secretly steal a card onto the bottom of a packet as you count through that packet. A method for throwing a card in the air and having it come back to you. Secretly control a card or group of cards to the bottom of the deck. Maintain a packet of cards on the bottom of the deck while shuffling. A bent card in the middle of the deck visibly pops to the top of the deck. Secretly separate the bottom or top card from the deck or a packet of cards. A method for moving a card or packet of cards to another location within the deck. Move for splitting the deck and swapping the packets. Show two cards as if they were one. Turn over two cards as if they were one. Control a card to the top or bottom of the pack while cutting the deck. Flourish in which cards are sent from one hand to the other. 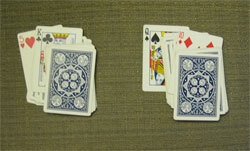 Maintain a packet of cards on the top and bottom of the deck while performing a riffle shuffle. Quickly show a spectator a card. Make an entire packet appear is if it is made of duplicates of a single card. Secretly steal a card or packet of cards from the bottom of the deck. Deal cards from the bottom of the deck while retaining the position of the bottom card. Mark the location of a card in the deck. Hide the last of four cards as you count them. Remove the hidden card from a double lift. Force a selection on the spectator. Place a card second from top under the guise of inserting it into the middle of the deck. Switch a card on the table with a card in your hand while turning over the card on the table. Tilt the deck upwards so that the spectator can't see the top of it. Mark the location of a card in the deck for spectator's to see. A method for shuffling the cards in a deck. Secretly conceal a card in your hand. A control in which the deck is secretly cut. Secretly look at the face of a card. Secretly hold a division in the deck with your pinky. Method for getting a break below a desired number of cards from the top of the deck. Method for getting a break above a desired number of cards from the bottom of the deck. Spread the cards out on the table. Method for quickly thumbing through the cards in a deck. Force a card by riffling through the deck and having the spectator stop you at a card. Method for mixing up the cards in a deck. Fan the cards in between your hands. Align the cards in the deck. Secretly hold a division in the deck with your thumb while in Mechanic's grip. Secretly hold a division in the deck with your thumb from above.. 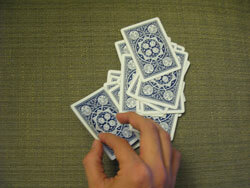 Secretly hold a division in the deck with your thumb while in Biddle grip. Spread the cards in a fan in your hand. Secretly load a card on top of another card as you turn it over. Secretly exchange the top card with another card. Secretly load a card or packet of cards onto the bottom of a group of cards that you remove from the deck. Turn the deck downwards so that the spectator can't see the top of it.